Details relating to the Maltese Commemorative of 2011. 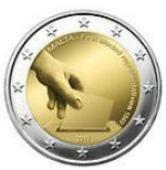 This coin is the first in a five part series dealing with the constitutional history of Malta. The coin commemorates the election of eight Maltese representatives to the government in 1849. Malta had been a British crown colony since 1814. In the inner circle a hand putting a vote into a ballot box is depicted. An inscription, running around the edge of the inner circle from eleven to four o’clock reads “MALTA – First elected representatives 1849”. The year of issue 2011 is at the bottom of the inner circle. The coin has no mint mark. 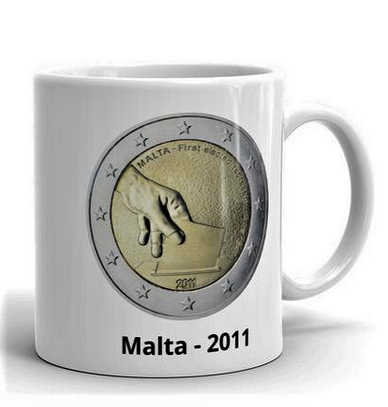 Return from Maltese Commemorative 2011 to euro coin collector.